You want to have a holiday but you have no one to go with. Going on holidays on your own can be scary, especially for older men and women who perhaps always had a spouse to travel with. To celebrate my 66th birthday I wanted to treat myself to a long wished-for dream; a Mediterranean cruise. But my husband could not get away on the dates I wanted. So I opted to go on my own. And it was one of the best holidays I ever had. The travel agent suggested I try Norwegian Cruise Lines as it caters for solo passengers. Not only did that mean a single cabin for just one person, but every evening at 6pm solo travellers are invited to the Studio Lounge to meet other people holidaying on their own, and then all go together for dinner at one of the eight restaurants on board the ship. What an entertaining mixed bunch of people travel on their own; males and females of all ages, different nationalities, cultural backgrounds, and occupations. The group I mixed with included an Australian lawyer, a hospital porter from Llandudno, a London taxi driver, a Moroccan lady banker, a beautiful Russian woman, as well as several retirees from a variety of places and employment. And one thing they all had in common – they all loved cruise ship holidays. My voyage on the Norwegian Epic began by flying to Barcelona where I was picked up by a shuttle bus and driven to the ship. What a majestic sight the cruise liner was. She carries more than 4,000 passengers and almost 2,000 staff; the size of an Irish town floating on the Mediterranean Sea. I have since been asked was it not claustrophobic, or did I get seasick. An emphatic no is the answer to both. There was plenty of room on board to be on your own or to join in all the activities and entertainments on offer. And the ship is so huge she rode the waves as serenely as a swan on a lake. The first day was spent sailing from Spain to Italy and Deck 15 was the place to be. Basking in glorious sunshine on sun-loungers on several levels, overlooking two swimming pools, six Jacuzzis, three huge tubular slides, kiddies’ paddling pool, showers, water features, while surrounded on all sides by the open sea! I was in heaven. If it all gets a bit too hectic, then off you go down to the end of the ship – or aft, as it’s called – to another pool area where children are excluded. The ship stopped at six ports and people disembarked to visit places either on booked excursions or finding their own way around. The first port of call was Naples, and I had booked an excursion to Pompeii. It was an amazing experience. The second day was to visit Rome, which I did on my own, taking the two-hour commuter train from the port of Civitavecchia and then touring Rome on the open-topped Big Bus, the combined cost being about €35. Through the night we sailed next for Florence and/or Pisa. The art and architecture to be found in Florence is stunning and some day I have to return. Visiting places on a cruise means one only gets a snapshot of the locality as it is imperative to be back on board at the given time, or the ship sails without you. Cannes was the fourth destination and a good many people, including myself, stayed on board, mostly on Deck 15, lazing about in glorious sunshine or availing of the many activities – energetic or sedentary - the ship organises for everyone from children, teenagers, to the elderly, all of which are listed in a daily newsletter and left in each cabin. Marseilles was my last port of call and it is not just a huge dockland but a delightful historic city. Other features of the cruise holiday that also impressed me were the excellence of the food served in all the restaurants and the selection of entertainment available every night. Excursions were extra and varied in price for half or full day trips, but cost a minimum of around €100. 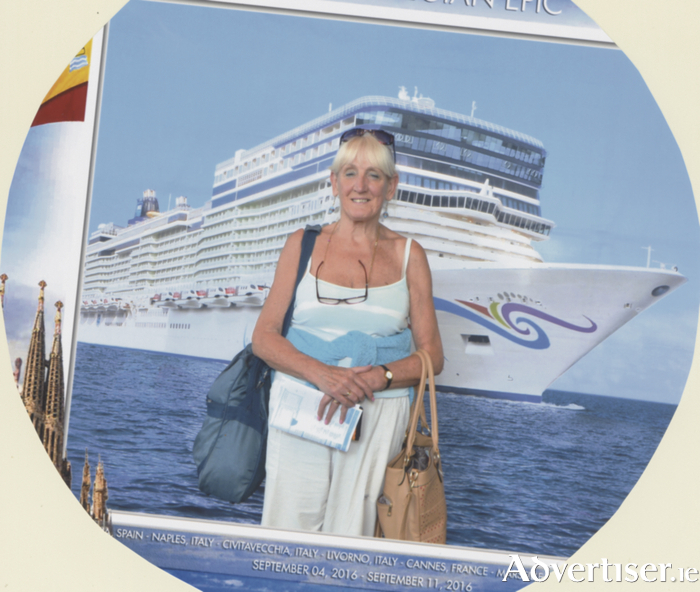 I had paid for food and drink to be included, which worked out great, and my seven-night cruise cost €1,550. Prices of course vary depending on dates, standard of accommodation, chosen package. But one thing is for sure, like my fellow solo passengers I am hooked on cruising. And maybe next time I’ll bring my husband along.